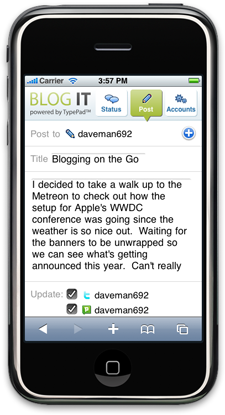 So after being frustrated with the iPhone TypePad App, I decided to check out Blog It, and came away generally being pleased. It is an iPhone optimized web application that you can't even view without using Safari on the iPhone. It was written by Six Apart, the same people that own TypePad, Movable Type, and Vox. The initial experience was a joy, because despite being a web app, it has a great iPhone interface. I was also quite pleased by the signup process, which uses OpenID. After a day of playing around with iPhone Apps, I can really see the value of just entering a single OpenID to register with a web service, rather then being asked for a username, a password, and then later confirming your account via email or sms. Fundamentally you can do two things with Blog It: update your status on multiple services; or post a text-only blog post to one or more of your blogs and optionally have a status message sent to your status services pointing back to the blog entry. However, like all iPhone web apps you have no ability to upload photos, no access without a network connection, and you are vulnerable to Safari crashes (which still happen too often with iPhone OS 2.0). Ideally I'd like the features of all three together: the photo uploading and draft creation while disconnected capabilities of the iPhone TypePad App; the comment maintenance features of i.typepad.com, and the OpenID and status features of Blog It. Of course, as long as I'm asking, supporting OAuth like the iPhone Pownce App does. Even with its limitations, I've bookmarked Blog It to my home screen with an icon, despite of being tight on room on the Nine available iPhone home pages.